A closer look at your adrenal gland. Adrenocorticol Carcinoma: begins in the outside layer of the adrenal gland, or adrenal cortex. Malignant Pheochromocytoma: begins in the inner layer of the adrenal gland, or adrenal medulla. There are two adrenal glands in the body located on top of the kidneys. Each adrenal gland has two parts: the outer layer is the adrenal cortex; the inner layer is the adrenal medulla. Both have an important role to play in maintaining bodily functions. When cancer cells break away from the primary (original) tumor and travel through the lymph or blood to other places in the body, another (secondary) tumor may form. This process is called metastasis. The secondary (metastatic) tumor is the same type of cancer as the primary tumor. For example, if adrenal cancer spreads to the lung, the cancer cells in the lung are actually adrenal cancer cells. The disease is metastatic adrenal cancer, not lung cancer. 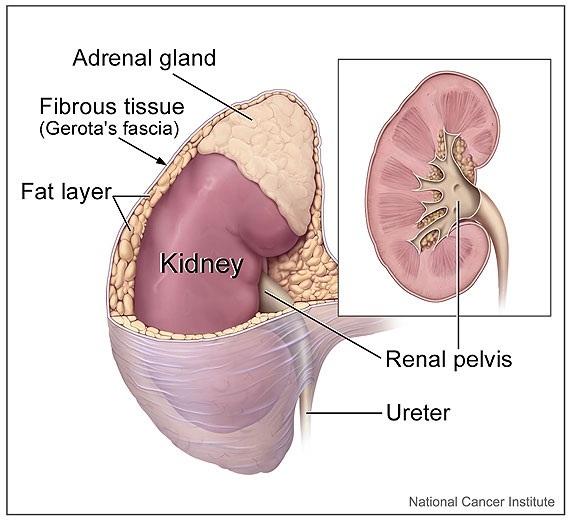 General symptoms of adrenal cancer include a lump in the abdomen or pain in the abdomen or back. The appearance of additional symptoms depend on whether the tumor is functioning (makes more hormones than normal) or nonfunctioning (does not make hormones). A nonfunctioning tumor may not have any signs. However, the excess of hormones produced by a functioning tumor trigger a variety of side effects depending on the hormone released. Most functioning tumors in the adrenal gland are benign and not cancerous, but can still be dangerous due to the excess of hormones they make. These symptoms may be the result of a condition other than cancer. If you are experiencing any of the above, you should speak with your physician to determine the exact cause.